...it`s too `wax for me!" 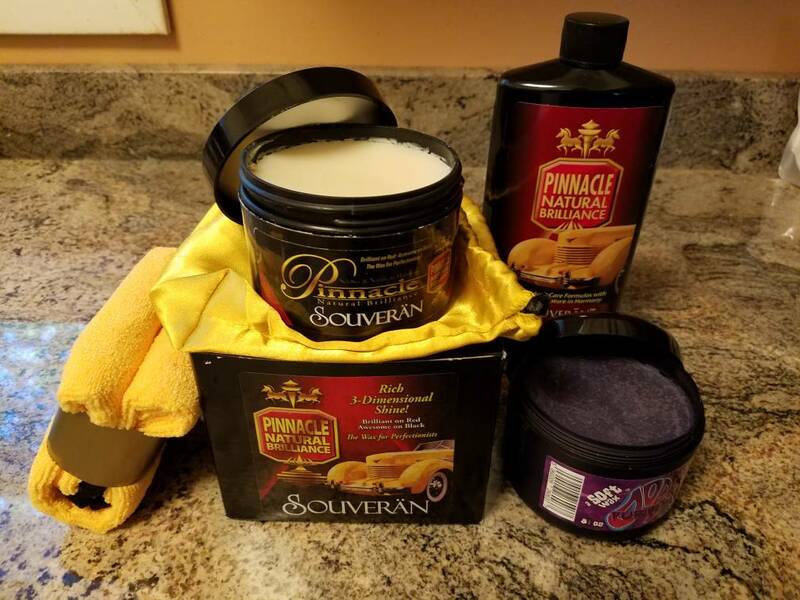 Nearly new Pinnacle Souveran Paste, Pinnacle Souveran Spray Wax and Dodo Juice Purple Haze Soft Paste Wax. Free to a good home; don`t wanna split `em up, just wanna put `em a box and ship them to you! And I`ll even cover shipping so no cost/no risk proposition. You are the man! I`d love some more LSP, but have more than I need. I`ll trade you a tin of never opened Fusso Coat, from Soft 99 for the bunch. Only way I would feel ok with taking it from you. I think I used it maybe twice. It looked nice and rich if I recall correctly; show car wax for sure, not much durability. Trying to pawn off some WG Fuzion, WGDGPS 3.0 and WGDG Sealant Spritz over on CorvetteForum Car Care section; if no takers I`ll offer it up here as well. Don`t sweat it, I`m trying to get rid of things! If it doesn`t go on the Vette forum by tomorrow night, I`ll offer it up here. As for Zaino, I threw out all my Zaino stuff last summer. The etched water spots on our Vette thanked me. Wax off to LEDetailing. Enjoy. Fuzion/WGDGPS spoken for if no takers in corvette forum, Mark08EX. I feel it is only fair that I continue the generosity of BudgetPlan1. So, to the person who promises to "pay it forward" however they see fit. I`m offering up a free/no shipping tin of Soft 99, Fusso Coat, for light vehicles. The stuff is awesome. I have two tins and don`t need two. Send me a PM with your address and I mail it out tomorrow. Posts in either thread are valid. I`ll look at time stamp to determine first person to ask for it. you are sending boxes of shine. hooray for boxes of shine!